Reporting on its Q1 2018 financial results, Apple has announced net profits of over $20 billion ($3.89 per diluted share) on revenues of $88.3 billion. The company’s revenues were up 13 percent compared to the year-ago quarter, with net profits up a healthy 16 percent. Apple CEO Tim Cook said that the quarter set records for both revenue and profits, even though this year’s first quarter was one week shorter than last year’s (see “Apple Sees Apparent Return to Growth with Q1 2017’s Record Results,” 31 January 2017). Nonetheless, the specific product sales details are somewhat less rosy. iPhone sales remain Apple’s strong suit, with a year-over-year revenue increase of 13 percent. Perhaps worryingly, Apple saw a 1 percent drop in units sold, despite the double-digit jump in revenue. The discrepancy between unit sales and revenues likely can be explained by the high price tag of the iPhone X, which CEO Tim Cook said “has been our top-selling iPhone every week since it shipped in November.” And, to reiterate, iPhone unit sales figures represent 13 weeks of sales this year, compared to 14 weeks in the year-ago quarter, a fact that might also help account for the slight decline in unit sales: weekly sales of iPhones during the quarter were up 6 percent compared to the same quarter last year. iPad sales held steady compared with the same quarter a year ago, chalking up a 1 percent increase in tablets sold, and Cook noted that it was the third consecutive quarter to see growth in iPad revenues. The higher-priced iPad Pro models helped boost iPad revenues 6 percent over those in the first quarter results for 2017. Weekly sales of iPads were up 8 percent over the year-ago quarter. Mac sales saw a 5 percent drop in quarterly sales year over year, with slightly more than 5 million units sold, realizing $6.89 billion in revenue. Apart from the new iMac Pro, no new Macintosh models entered the market during the quarter. Once again, the shorter quarter accounts for some of this decline: weekly sales of Macs increased by 6 percent compared to the 2017 first quarter results. Apple’s Services division continues to see impressive growth, with an 18 percent year-over-year increase in revenue. 538 million customers passed through Apple’s retail stores last quarter, a number rather larger than the population of the United States (currently about 327 million). Paid subscriptions, encompassing both apps and media, passed 240 million by the end of the quarter, and Apple Pay adoption by merchants has increased by 50 percent. 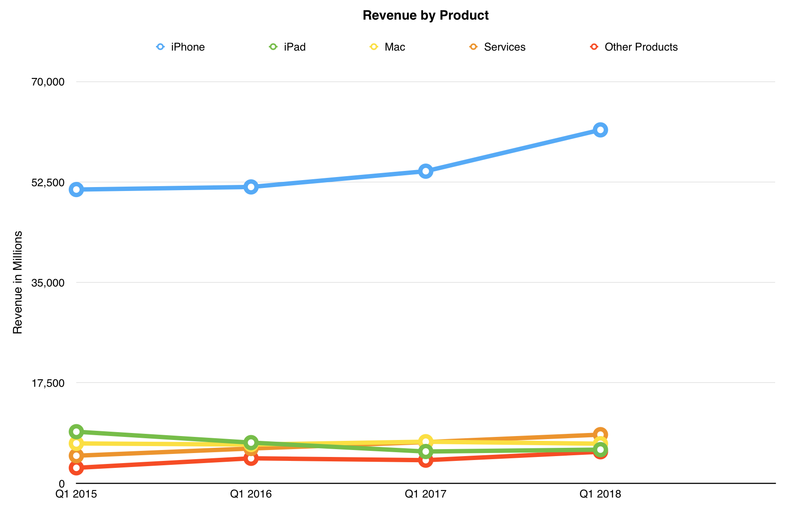 At $8.4 billion, Apple’s Services division revenue exceeds that of the iPad and the Mac and seems to be Apple’s one consistent point of growth. In other words, don’t expect more free iCloud storage anytime soon. But the growth king in the quarter was the Other Products division, which saw a stunning 36 percent year-over-year revenue increase — this despite the delay in the release of Apple’s HomePod speaker until this month. At this rate, the Other Products division will eclipse iPad revenue in Q1 2019. AirPods, Apple TV, Apple Watch, Beats products, and the iPod touch must be selling like hotcakes. Well, maybe not the iPod touch. Wearable sales, which include AirPods, Apple Watch, and Beats products, were up 70 percent. Speaking of the HomePod, Cook said some curious things when asked about it during the quarterly investor call. He repeatedly mentioned using HomePod to control a fireplace via HomeKit. Unless Tim knows something we don’t, the main way we know of to do that is via do-it-yourself hacks (you could also use a smart wall switch if your fireplace is wired up that way). He also mentioned calling Uber from the HomePod, but you can’t initiate calls from HomePod. Plus, as 9to5Mac’s Benjamin Mayo pointed out, the HomePod doesn’t support the ride-sharing functions of SiriKit; in any case, it appears that Uber has abandoned Siri support entirely. Does Apple’s own CEO not know what his big upcoming product can do? You may also be wondering about Apple’s response to the new tax law enacted here in the United States, which has spurred Apple to bring back nearly all of its $250 billion in foreign cash (for background on the controversy surrounding Apple’s foreign cash holdings, see “Apple Grilled Over Tax Practices,” 24 May 2013). For now, CFO Luca Maestri seemed to be as clueless as the rest of us about the tax law, but he promised more announcements about how Apple would be using its newfound cash during the Q2 investor call in March 2018. Finally, there was some concern from analysts that customers are replacing their Apple devices less frequently than in the past. When asked whether Apple was concerned that its new iPhone battery replacement program was cutting into upgrades, Cook replied that Apple never considered that, but only wanted to “do the right thing.” Color us skeptical — it would seem to be somewhat irresponsible to shareholders if Apple hadn’t at least considered the impact of the battery replacement program on sales, no matter how briefly. Despite any concerns about the company, the installed base of all major Apple products has hit an all-time high of 1.3 billion devices, which bodes well for the continued health of the company’s services ecosystem. And device sales, while not achieving rocket-like trajectories, are, at worst, steady. The fact is that customer satisfaction, even in the face of Apple’s recent missteps with system bugs and iPhone battery problems, is still exceptionally high (“off the charts” is how Cook described it), and unless that begins to decline, Apple’s future continues to look bright.